In 1995 William C. Stokoe arrived at Gallaudet College (later Gallaudet University) to teach English, specifically Chaucer. His own education in Old and Middle English, however, triggered a disparate response within him when he was first exposed to deaf people signing. While most of his colleagues conformed to current conventional theory and dismissed signing as mere mimicry of speech, Stokoe saw in it elements of a distinctive language all its own. 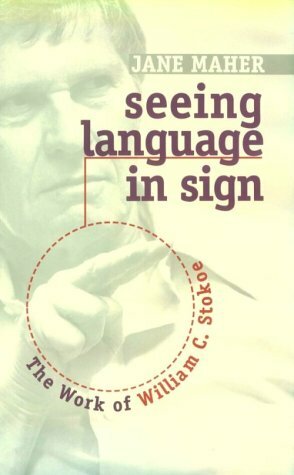 Seeing Language in Sign traces the process that Stokoe followed to prove scientifically and unequivocally that American Sign Language (ASL) met the full criteria of linguistics - phonology, morphology, syntax, semantics and use of language - to be classified a fully developed language. This perceptive account dramatically captures the struggle Stokoe faced in persuading the establishment of the truth of his discovery. Other faculty members ridiculed or reviled him, and many deaf members of the Gallaudet community laughed at his efforts. Seeing Language in Sign rewards the reader with a rich portrayal of an undaunted advocate who, like a latter-day Galileo, pursued his vision of doggedly regardless of relentless antagonism. He established the Linguistics Research Laboratory, then founded the journal Sign Language Studies to sustain an unpopular dialogue until the tide changed. His ultimate vindication corresponded with the recognition of the glorious culture and community that revolves around Deaf people and their language, American Sign Language. If you have any questions about this product by Gallaudet University Press, contact us by completing and submitting the form below. If you are looking for a specif part number, please include it with your message.